Brooks Garage Doors is a family-owned business with its headquarters right here in Brooks, AB. We have been proudly serving our community for over 30 years. Providing exceptional products and expert service at a reasonable price is our priority. When it comes to quality, we’ve got you covered. 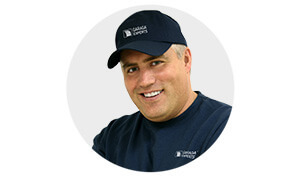 Since we have been selling Garaga garage doors for so many years, we are confident that they are the best. We love their solid construction, energy-efficient insulation and beautiful finishes. We carry Garaga’s full line of residential and commercial garage doors, which can be seen in our online image gallery. Whether you’re looking for a new garage door or need your existing one repaired, our employees are standing by to serve you. Call us at 1-403-362-5813 to schedule an appointment. You may also reach us by completing our online quotation form. We will happily provide you with a free estimate on any installation, repair or maintenance. We all know how big and heavy a garage door can be. To make your door convenient to use, we suggest adding an electric opener. At Brooks Garage Doors, we’ll help you find the best garage door opener for your home or commercial space. Our professional installation will ensure your garage door system is always safe to use. If you’re looking for the best garage door opener on the market, we recommend LiftMaster products by Chamberlain. These openers come equipped with the latest technology. Features like Wi-Fi and MyQ smartphone apps let you monitor your door, even when you’re not home. Let your new garage door opener do the heavy lifting for you! We are pleased to provide our customers with high quality products from reputable companies like Garaga and LiftMaster. To see our wide selection of commercial or residential door openers, please visit our gallery. Why work with us? Choosing Brooks Garage Doors means choosing fast and reliable service. As the area’s leading garage door provider, our employees have decades of experience in the installation, repair and maintenance of all types of overhead doors. And since we have specialized in Garaga garage doors for so long, we are also certified Garaga Experts. Since we know problems can occur at any time of day or night, we offer 24‑hour emergency service. Our large inventory of replacement parts, for both garage doors and door openers, lets us complete repairs without delay. We also offer preventative maintenance programs. At Brooks Garage Doors, we’ll make sure your garage door system is serviced quickly and safely. We serve customers in Brooks, AB and surrounding cities including Bassano, Jenner, Tilley, Hanna, Rolling Hills, Duchess, Cessford and Lomond. Need more information? Call us today at 1-403-362-5813. Our friendly staff will be happy to help! Brooks, Bassano, Jenner, Tilley, Hanna, Rolling Hills, Duchess, Cessford, Lomond and surrounding area.